Do you love tacos? Change up your regular taco night a little bit. 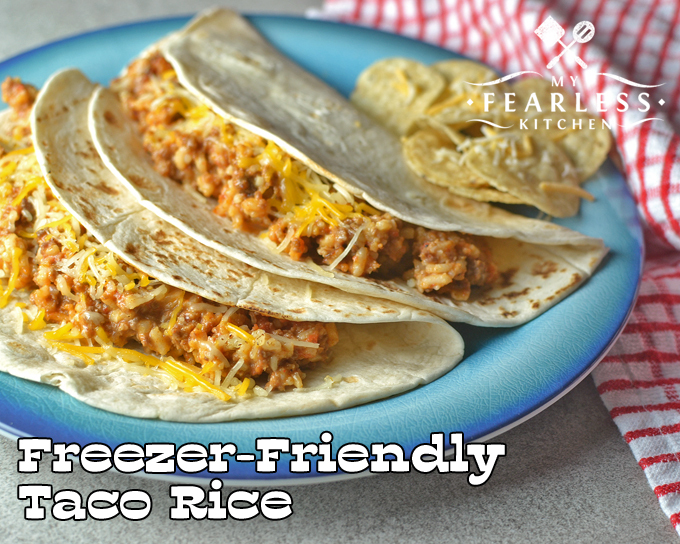 Make a double or triple batch of Freezer-Friendly Taco Rice for a quick delicious meal! We love tacos around here. They are so easy to make, and so much fun to eat! 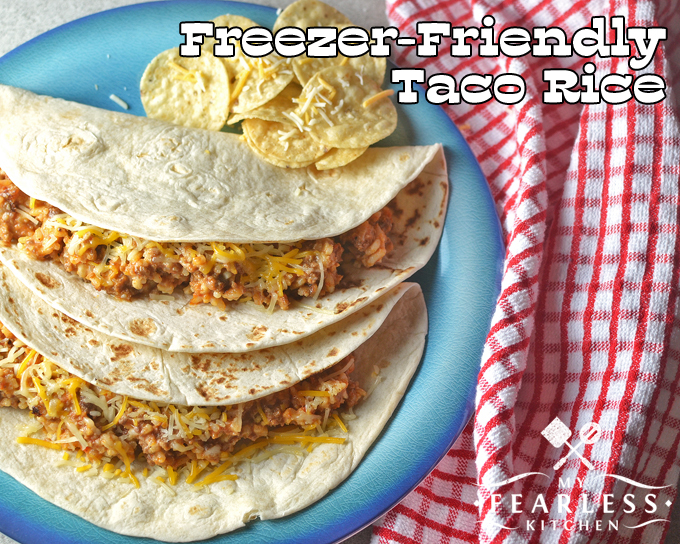 This recipe for Freezer-Friendly Taco Rice makes an easy meal even easier – and you can stash some in the freezer for another busy night! This recipe is from Our Favorite Freezer-Friendly Recipes by Gooseberry Patch. If you haven’t checked out this pocket-sized cookbook yet, you definitely should! It’s small, but it’s packed with great recipes. The best thing about taco-type meals is how flexible they are. (My other favorite thing is how yummy the leftovers are!) The first night we ate this like soft tacos. When we got into the leftovers, we spooned it over a plate of tortilla chips and topped it with extra cheese for some delicious nachos! Top it with extra cheese, sour cream, jalapeno slices, avocado, tomato.. whatever you like on your tacos! This recipe is so easy to make in larger batches. 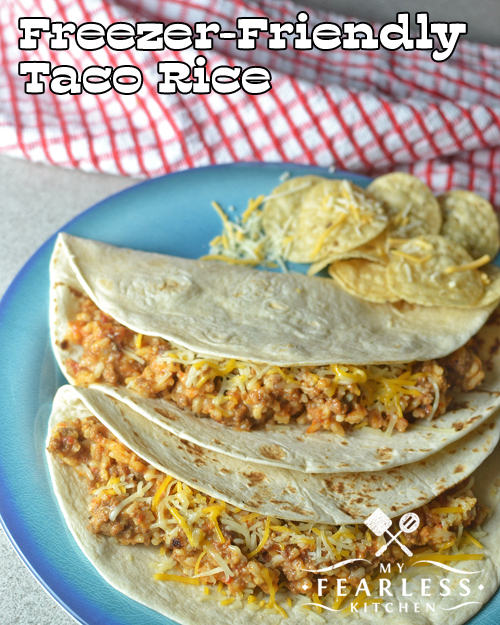 I made a whole bunch of ground beef in my crockpot and used 3 pounds to make a triple batch of this Taco Rice. I just tripled the recipe (but I did not add the water yet), and mixed it up in a large bowl. Seriously, you need a really big bowl. Then I split it into 3 portions, kept one out for dinner, and put the other 2 portions in gallon-size Ziploc bags. Into the freezer they went! Now we have the makings for tacos, burritos, or some very delicious nachos whenever we want! Extra cheese, tomato, avocado, or green onion for garnish. Brown ground beef and onion in a large saucepan. Stir in taco seasoning, water, rice, and diced tomatoes. Heat over low heat until heated through. Add shredded cheese and stir until cheese is melted. Serve immediately on taco shells, wrapped in a burrito shell, or over tortilla chips. Stir in taco seasoning, rice, diced tomatoes, and cheese. Do not add water. Transfer beef mixture to a gallon-sized Ziploc freezer bag. Label and freeze. Thaw overnight in the refrigerator. Pour beef mixture into a large saucepan. Add 1 cup of water. I have made this many times and it never gets to the taco shells. I have even thought I made enough for leftovers, but never had leftovers. Still trying tho.